"The first 'regular' post office in Wakefield was established in 1812 in a small building on Main Street. John Rayner served as the town's first Postmaster. In 1852, or soon after his appointment, Postmaster Samuel Kingman built a new home for the post office at the corner of Main and Albion Street, now known as Bourdon's Block. According to Wakefield history, Postmaster Kingman also initiated the first 'free delivery' of mail in town. Each Sunday morning he went to the post office and took some mail to various sections of town. There he waited for the churchgoers and presented them with the mail he carried in his hat. The post office was later moved to the corner of Main and Richardson Streets, to the building at 9 Albion Street (now home of the Wakefield Municipal Light Department), and to its present home at the corner of Main Street and Yale Avenue." -- Text from calendar by Jayne M. D'Onofrio. (Seated, left to right) Postmaster Charles B. Bowman, Mailing Clerk Fred A. Sweetser, and Assistant Postmaster Mrs. C.B. Bowman. (Standing, left to right) Sub Clerk Arthur L. Wiley, Carriers George W. Hunter, Ernest Haywood, John P. Bruver and Sub John B. Fairbanks. 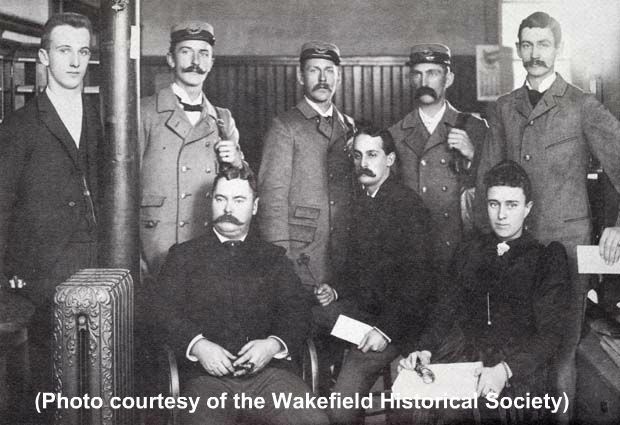 “Office force, carriers and sub, Wakefield Post Office, 1892,” NOBLE Digital Heritage, accessed April 20, 2019, https://digitalheritage.noblenet.org/noble/items/show/7040.